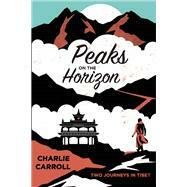 Charlie Carroll’s obsession began with his chance discovery of Seven Years in Tibet in the Adult Reading” section of his grade school library. The battered hardcover with faded gold lettering sparked a twenty-year obsession with Tibet, and after combing through every book, article, and documentary on the mysterious and controversial nation, Charlie finally decided it was time to stop reading other people’s records and thoughts. A high school English teacher by then, he took a sabbatical and set out to experience the shrouded land for himself. Contending with Chinese bureaucracy, unforgiving terrain, and sickness-inducing altitude, Charlie sought entrance to twenty-first-century Tibet in all its heart-stopping beauty. The same year Charlie was browsing library shelves, Tibetan-born Lobsang was crossing the Himalayas on foot, enduring to flee the volatile region with his family at the young age of five. An exile in Nepal with an ear for languages, then a university student in India, he followed the love of his life back to their home country, only to be separated by China’s harsh political backlash. In a teahouse at the border between China and Tibet, Lobsang met Charlie and recounted his extraordinary life story, exemplifying the hardship, resilience, and hope of modern Tibetan life. Charlie Carroll is the author of On the Edge (Monday Books, 2010), serialized in the Daily Mail and The Week and described by The Telegraph as remarkable.” Charlie has spoken on BBC Radio 5Live and local BBC radio stations, and written for The Guardian and The Big Issue.